Preparation of the International Congress and Trade Fair on Forest Fire and Climate Change: Challenges for Fire Management in Natural and Cultural Landscapes of Eurasia, hosted by the Russian Federation in partnership with the Global Fire Monitoring Center (GFMC); Novosibirsk, Russian Federation, 11-13 November 2013. Work visit of Falko Regional Aircraft Limited; GFMC. Annual course Natural Hazards and Risk Management within the Master Programme “Forest Ecology and Management”, Faculty for Forest and Environmental Sciences, Freiburg University (J.G. Goldammer, O. Byambasuren); Freiburg, Germany. 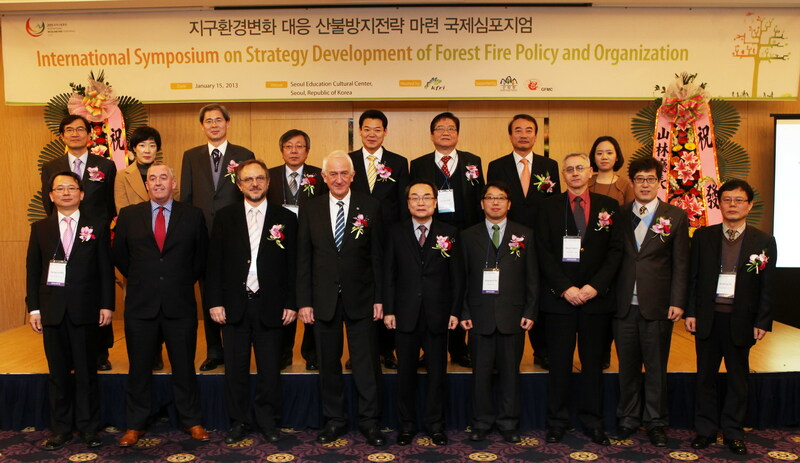 International Symposium on Strategy Development of Advanced Forest Fire Policy and Organization, hosted by the Korea Forest Research Institute (KFRI), supported by the Korea Forest (KFS), the UNECE/FAO Team of Specialists on Forest Fire, and GFMC (J.G. Goldammer); Seoul, Republic of Korea. International Workshop Training Area Management, Open Areas and Nature Protection: Management of Open Areas, with GFMC contribution on Prescribed Burning (J.G. Goldammer); University of Natural Resources and Life Sciences, Vienna, Austria. Collaborative work with the Tree-Ring Laboratory, Lamon-Doherty Earth Observatory, Columbia University, USA, on climate history and fire ecology in Mongolia, sponsored by the U.S. National Science Foundation (O. Byambasuren); Columbia University, U.S.A.
GOFC-GOLD EXCOM and Fire IT telephone conference (J.G. Goldammer); Wageningen University / GFMC. 9th Southern African Fire Network (SAFNet) meeting Strengthening the ties with ongoing initiatives on fire research and management within the region – Collaborative fire information, resource sharing, training and research in support of integrated fire management in Southern African countries (A.A. Hoffmann, with presentation of GFMC); Tanzania Forestry Research Institute, Morogoro Tanzania. Meeting of the coordinators of the field project Erprobung und Entwicklung von Methoden zur Heidepflege durch kontrolliertes Feuer auf munitionsbelasteten Flächen im NSG Heidehof-Golmberg (Landkreis Teltow-Flaeming) (2009-2013) (Prescribed burning on former military terrain contaminated by unexploded ordnance [UXO], Teltow-Flaeming County, Germany), and planning of wildfire buffer zones around terrain contaminated by UXO (J.G. Goldammer); Luckenwalde, Germany. Field mission of GFMC staff Ioannis Mitsopoulos in following-up of the conference Our Response to Wildfire Threat – Cooperation of a better Chios, held 15-16 October 2012 by the Maria Tsakos Foundation, sponsored by the Minister of Mercantile Marine and Island Policy of Greece, and in cooperation of the Regional Prefecture of Chios Island, with GFMC contribution United Nations Partnerships in Strengthening the Role of Civil Society in Fire Management, presented by J.G. Goldammer on behalf of the UN Secretary General, BAN Ki-moon, and the United Nations Office for the Coordination of Humanitarian Affairs); Chios, Greece. Inauguration of the Regional Eastern European Fire Monitoring Center (REEFMC) and Regional Seminar and Consultation Wildfires in the Eastern European Region: Science, Policies and Management, at National University of Life and Environmental Sciences of Ukraine (NULESU) / Regional Eastern European Fire Monitoring Center; supported by GFMC, UNECE/FAO Team of Specialists on Forest Fire and Council of Europe (J.G. Goldammer, P. Sheldon); Kyiv, Ukraine. Stakeholders workshop of the GEF project Conserving, Enhancing and Managing Carbon Stocks and Biodiversity while Promoting Sustainable Development in the Chernobyl Exclusion Zone through the Establishment of a Research and Environmental Protection Centre and Protected Area, with GFMC contribution to the fire management component (J.G. Goldammer, P. Sheldon); Ministry of Ecology and Natural Resources, Kyiv, Ukraine. Consultation between GFMC, the Regional Fire Monitoring Center (Skopje, FYROM), the Balkan Environment Center (Thessaloniki, Greece), the Regional Fire Management Training Center (Antalya, Turkey) and members of the UNECE/FAO Team of Specialists on Forest Fire, on coordination and sharing resources in enhancing fire monitoring and fire management capacity building in fire management in the SE Europe / Balkans region (J.G. Goldammer, I. Mitsopoulos, N. Nikolov); Thessaloniki, Greece. Preparation of the National Round Table on Fire Management Greece (Athens, 14 May 2013) and the Second Regional Workshop Development of Guidelines for the Defense of Rural Populations, Settlements and other Assets Against Wildfires and Smoke Pollution for the EECCA Region (J.G. Goldammer, I. Mitsopoulos, A. Dimitrakopoulos); Thessaloniki, Greece. Kick-off meeting of the International Working Group on Cooperation in Wildfire Preparedness and Response for the development of a proposal for international voluntary standards for harmonization, standardization and promotion of best-practice and for safe and efficient sharing of wildfire emergency response resources between countries for wildfire emergency analysis & assessment, wildfire emergency advisory support to nations in distress and wildfire emergency response (in preparation of the UNECE/FAO Forum on Cross-boundary Fire Management (United Nations, Geneva, 28-29 November 2013); GFMC. Consultations on Fire Management in Mongolia and neighbouring Central Asian States in the frame of the UNISDR Central Asia Wildland Fire Network (Oyunsanaa Byambasuren); Ulaanbaatar, Mongolia. Aerial Firefighting Europe: International Conference and Exhibition, cosponsored and under the co-auspices of GFMC / UNISDR Wildland Fire Advisory Group / International Fire Aviation Working Group (IFAWG), with participation of members of the UNECE/FAO Team of Specialists on Forest Fire and GFMC contribution International Cooperation in Fire Management: Political and Ground-to-Aerial Perspectives (J.G. Goldammer, P. Sheldon); Aix-en-Provence, France. 3rd GOFC-GOLD Symposium with presentation of the Global Wildland Fire Early Warning System and Meeting of the GOFC-GOLD Fire Implementation Team (J.G. Goldammer); Wageningen, The Netherlands. Second prescribed burning campaign in the field project Erprobung und Entwicklung von Methoden zur Heidepflege durch kontrolliertes Feuer auf munitionsbelasteten Flächen im NSG Heidehof-Golmberg (Landkreis Teltow-Flaeming) (2009-2012) (Prescribed burning on former military terrain contaminated by unexploded ordnance [UXO], Teltow-Flaeming County, Germany) (J.G. Goldammer, P. Sheldon); Nuthe-Urstromtal / Heidehof-Golmberg Nature Reserve, Germany. Thirty-fifth session of the Joint FAO/UNECE Working Party on Forest Statistics, Economics and Management, Economic Commission for Europe Food and Agriculture Organization, Timber Committee European Forestry Commission, with presentation of the report of the UNECE/FAO Team of Specialists on Forest Fire (J.G. Goldammer); United Nations, Geneva, Switzerland. Joint meeting of the German-Russian Working Group on Sustainable Forest Management (German Federal Ministry for Food, Agriculture and Consumer Protection and Federal Forest Agency of the Russian Federation), on bilateral cooperation in forestry, including the joint fire management programme (J.G. Goldammer); Hanover, Germany. Workshop Defense of Villages, Farms and Other Rural Assets against Wildfires: Guidelines for Rural Populations, Local Community and Municipality Leaders in the Balkan Region, supported by Council of Europe, the Regional Fire Monitoring Center SE Europe / Caucasus (RFMC), Regional Eastern European Fire Monitoring Center (REEFMC) and the UNECE/FAO Team of Specialists on Forest Fire (J.G. Goldammer, I. Mitsopoulos); European Center of Forest Fires (ECFF), National Technical University of Athens, Athens, Greece. Members of the Guidelines Review Workshop. From right to left (double-click for enlarging the photo): Andrey Eritsov (Russia, UNECE/FAO ToS Forest Fire), Ioannis Mitsopoulos (ECFF/GFMC), Ertugrul Bilgili (Turkey, UNECE/FAO ToS Forest Fire), Gavrill Xanthopoulos (Greece, UNECE/FAO ToS Forest Fire), Alexander Dimitrakopoulos (Greece, Aristotelion University, Thessaloniki), Johann G. Goldammer (GFMC, UNECE/FAO ToS Forest Fire), Sergiy Zibtsev (Ukraine, REEFMC, UNECE/FAO ToS Forest Fire), Milt Statheropoulos (ECFF), Nikola Nikolov (RFMC, UNECE/FAO ToS Forest Fire), Manina Dourali (Greece, Groovy Graphics), Goran Videc (Croatia, UNECE/FAO ToS Forest Fire), Sofia Karma (ECFF), Foivos Stamboliadis (Greece, General Secretariat for Civil Protection). National Round Table on Fire Management Sharing Responsibilities and Resources at Economically Difficult Times, under the co-auspices of the Hellenic Agricultural Organization “Dimitra”, General Secretariat for Civil Protection, General Secretariat of Forests, General Secretariat of the Ministry of Environment, Energy and Climate Change, and the UNECE/FAO Team of Specialists on Forest Fire; supported by Council of Europe and Maria Tsakos Foundation (J.G. Goldammer, I. Mitsopoulos); Evgenideio Conference Center, Athens, Greece. 4th Session of the Global Platform for Disaster Risk Reduction, with contribution of the Global Wildland Fire Network / UNISDR Wildland Fire Advisory Group (J.G. Goldammer, P. Sheldon); United Nations, Geneva, Switzerland. Second meeting of the International Working Group on Cooperation in Wildfire Preparedness and Response for the development of a proposal for international voluntary standards for harmonization, standardization and promotion of best-practice and for safe and efficient sharing of wildfire emergency response resources between countries for wildfire emergency analysis & assessment, wildfire emergency advisory support to nations in distress and wildfire emergency response (in preparation of the UNECE/FAO Forum on Cross-boundary Fire Management, United Nations, Geneva, 28-29 November 2013); GFMC. IWG-CWP members (center photo, from left to right: Jean-Michel Dumaz (FR), Dale Dague (US), Robert Stacey (UK), Steve Gibson (UK), Johann G. Goldammer (GFMC), Mark Jones (UK), Oyunsanaa Byambasuren (GMFC), Pete Sheldon (GFMC) and Marc Castellnou (ES). IFAWG Chair Richard Alder (AU) connected by teleconference. Meeting with delegations from Law Enforcement University (LEU) of Mongolia. Discussion on current situation and challenges on forest-steppe fire related criminals. Second International Fire Management Week in Krasnoyarsk Krai, Russian Federation, organized by the GFMC and the Russian Federal Forest Service Rosleskhoz and the National Aerial Forest Fire Center Avialesookhrana in the frame of the German-Russian Forest Fire Task Force and the UNISDR Regional Eurasia Wildland Fire Network (UNECE/FAO Team of Specialists on Forest Fire), with (a) Scientific Conference Post-Fire Natural Regeneration of Forests in Siberia, and (b) revisit of the Bor Forest Island Fire Experiment of 1993 (J.G. Goldammer, O. Byambasuren); Krasnoyarsk, Bor Forest Island, Russian Federation. United Nations/Germany Expert Meeting on the Use of Space-Based Information in Early Warning Systems (J.G. Goldammer); Bonn, Germany. GFMC mission to Brazil in the frame of the Projeto Prevencao, Controle e Monitoramento de Incendios no Cerrado (GIZ / Ministério di Meio Ambiente) (J.G. Goldammer); ACADEBio, Iperó, Sao Paulo; Brasilia, Brazil. Seminar Fire Management in Protected Areas, hosted by the Brazilian Ministry of Environment, with GFMC contribution Fire Management on Protected Areas with particular emphasis on UNESCO World Cultural and Natural Heritage Sites (J.G. Goldammer); Training Academy of Chico Mendes Institute for Biodiversity Conservation / National Academy of Biodiversity (ACADEBio), Floresta Nacional de Ipanema, Iperó, State of São Paulo, Brazil. Fire management field campaign at Ecological Station Serra Geral do Tocantins and in State Park Jalapão (J.G. Goldammer and Jalapão / GIZ Fire Management Teams); State of Tocantins, Brazil. Palestra e Debate Manejo Integrado de Fogo: Estado da Arte no mundo e aplicação no Brasil (J.G. Goldammer); Auditório I do IBAMA Sede, Brasilia, Brazil. High-level panel discussion about the development of an Integrated Fire Management Policy of Brazil. Heloísa Miranda (Universidade de Brasília) and Rodrigo de Moraes Falleiro (IBAMA /Prevfogo). Project implementation Defense of Villages, Farms and Other Rural Assets against Wildfires: Guidelines for Rural Populations, Local Community and Municipality Leaders in the Balkan Region, supported by Council of Europe and the UNECE/FAO Team of Specialists on Forest Fire (Ioannis Mitsopoulos, Oyunsanaa Byambasuren, Pete Sheldon); GFMC. Mongolia mission: (a) fire history and climate research field expedition, (b) on-site consultations to strengthen fire management capacity in Mongolia (with NEMA and MEGD), and (c) preparation of establishment the UNISDR Central Asia Fire Monitoring Center (Oyunsanaa Byambasuren); Uvurkhangai Aimag and Ulaanbaatar, Mongolia. Consultations of the field project Erprobung und Entwicklung von Methoden zur Heidepflege durch kontrolliertes Feuer auf munitionsbelasteten Flächen im NSG Heidehof-Golmberg (Landkreis Teltow-Flaeming) (2009-2012) (Prescribed burning on former military terrain contaminated by unexploded ordnance [UXO], Teltow-Flaeming County, Germany) (J.G. Goldammer); DTF/DiBuKa, Seehausen, Germany. Phase I of field study Wildfire risk in the UNESCO Wold Heritage protected sites: A simulation study in Mt. Athos, Greece by employing very high resolution EO images and fine fuel sampling methods, aimed at characterizing fuel properties by using a terrestrial laser scanner and an automated procedure to derive the stand fuel properties from a voxel-based vegetation vertical profile in Mount Athos UNESCO World Heritage Site (I. Mitsopoulos); Mount Athos, Greece. Meeting with Freiburg Fire Service in preparation of urban-forest fire management plan (B. Oyunsanaa, J.G. Goldammer); Freiburg, Germany. Consultations of the field project Erprobung und Entwicklung von Methoden zur Heidepflege durch kontrolliertes Feuer auf munitionsbelasteten Flächen im NSG Heidehof-Golmberg (Landkreis Teltow-Flaeming) (2009-2012) (Prescribed burning on former military terrain contaminated by unexploded ordnance [UXO], Teltow-Flaeming County, Germany) (J.G. Goldammer); Luckenwalde, Germany. National Training for Trainers in Fire Management and Third National Round Table for developing a National Fire Management Policy for Armenia, a contribution of Phase III of the Environment and Security Initiative (ENVSEC) Enhancing National Capacity on Fire Management and Wildfire Disaster Risk Reduction in the South Caucasus through GFMC and the Organization for Security and Co-operation in Europe (OSCE) (J.G. Goldammer); Yerevan, Armenia. Eastern European Consultation in Preparation of the UNECE/FAO Regional Forum on Cross-boundary Fire Management (J.G. Goldammer); National University of Life and Environmental Sciences of Ukraine / Regional Eastern European Fire Monitoring Center (REEFMC), Kiev / Simferopol, Ukraine. 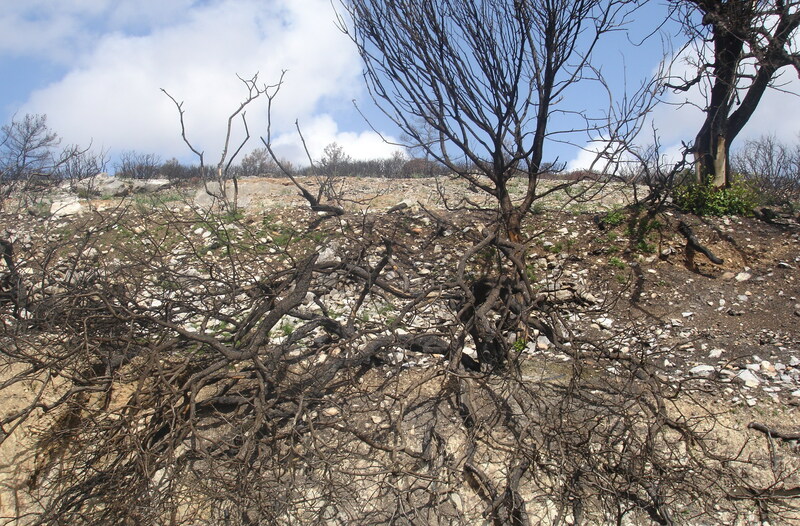 Consultation in Simferopol and field study of Pinus nigra stands near Yalta, Crimea, affected by fires over three centuries and nowadays fire-degraded. Followed by the celebration of the Knowledge Day at the National University of Life and Environmental Sciences of Ukraine / Regional Eastern European Fire Monitoring Center (REEFMC) and award of honorary doctor degree to the head of GFMC. Celebration of the Knowledge Day at the National University of Life and Environmental Sciences of Ukraine (NULESU) / Regional Eastern European Fire Monitoring Center (REEFMC) and award of honorary doctor degree to the head of GFMC; Kiev, Ukraine. General Assembly and 20th Anniversary of Green Cross International (GCI): Ceremony of Green Star Awards of GCI with the United Nations Office for the Coordination of Humanitarian Affairs (UN-OCHA) and the United Nations Environment Programme (UNEP) to awardees of the Global Wildland Fire Network Nikola Nikolov (Regional Southeast Europe Fire Monitoring Center, Macedonia), Sundar P. Sharma (UNISDR Regional South Asia Wildland Fire Network, Nepal) and Sergiy Zibtsev (Regional Eastern European Fire Monitoring Center, Ukraine); UN Geneva, Switzerland. 2013 Earth Dialogues entitled Pathways into the Future – Triggers of Change, comes at a time of deep crisis in multilateralism, hallmarked by a lack of consensus, and coordinated international action, to respond to rampant ecological breakdown, globalization and disparities between rich and poor. Third meeting of the International Working Group on Cooperation in Wildfire Preparedness and Response (IWG-CWPR) for the development of a proposal for international voluntary standards for harmonization, standardization and promotion of best-practice and for safe and efficient sharing of wildfire emergency response resources between countries for wildfire emergency analysis & assessment, wildfire emergency advisory support to nations in distress and wildfire emergency response (in preparation of the UNECE/FAO Forum on Cross-boundary Fire Management, United Nations, Geneva, 28-29 November 2013); Barcelona, Spain. IWG-CWPR visiting cultural landscapes of Catalonia in transition, where viticulture is abandoned on small, steep terraces, resulting in bush and forest encroachment and increased wildfire hazard; and local viticulturists now increasingly using biomass for energy production and reduction of wildfire hazard. Phase II of field study Wildfire risk in the UNESCO Wold Heritage protected sites: A simulation study in Mt. Athos, Greece by employing very high resolution EO images and fine fuel sampling methods, aimed at characterizing fuel properties by using a terrestrial laser scanner and an automated procedure to derive the stand fuel properties from a voxel-based vegetation vertical profile in Mount Athos UNESCO World Heritage Site (I. Mitsopoulos); Mount Athos, Greece. Joint meeting of the Commission for Peace and Security and the Commision for Environment, Energy and Spatial Planning, Socialist Party of Switzerland, on the future role of Switzerland in addressing global wildland fire issues, with a GFMC contribution for brainstorming (J.G. Goldammer); Bern, Bundeshaus, Bern, Switzerland. Fire Risk in the Forest Surrounding the Halki Seminary (Holy Orthodox Theological School): A Preliminary Study to Prevent Fire Damage or Destruction of the Theological School of Halki (I. Mitsopoulos); Heybeliada Island, Sea of Marmara, Turkey. GFMC Seminar and consultation on cooperation in fire management between FAO and GFMC (J.G. Goldammer); FAO Headquarters, Rome, Italy. 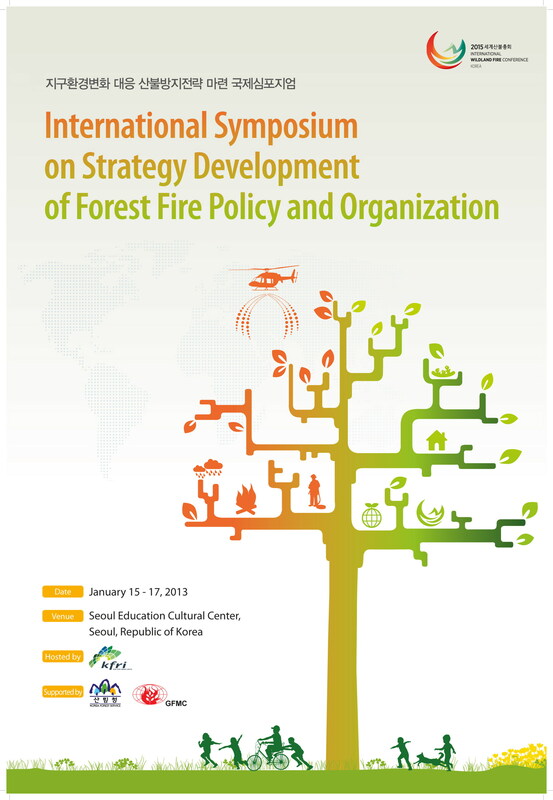 International conference on forest fire risk modelling and mapping. with GFMC contribution Assessing wildfire risk in the wildland – rural/urban interface by using spatial fire behaviour prediction in the Mediterranean Basin (I. Mitsopoulos); Aix en Provence, France. Meeting with the Fire Commissioner of Breisgau-Hochschwarzwald County, Mr. Alexander Widmaier, and Mr. Peter Meyer, in preparation of the forest fire fighting exercise, Breisgau-Hochschwarzwald County, 12 October 2013; GFMC. Work visit of Mr. Yevgeniy Vladimirovich Arkhipov, Kazakh Institute for Forest Resources Research, Shchuchinsk, Akmolinsky Oblast, Kazakhstan; GFMC. 16th Hellenic Forestry Society Conference, with GFMC contribution Assessment of wildland fire spatial behavior simulation accuracy based on local custom site-specific fuel models in two Mediterranean ecosystems of Greece using real-world historical fire data (I. Mitsopoulos); Thessaloniki, Greece. Forest fire fighting exercise, Breisgau-Hochschwarzwald County, Freiburg Region (GFMC staff); Hinterzarten / Rinken, Baden Wuerttemberg State, Germany. First Management Committee Meeting of the COST action FP1301 “Innovative Management and Multifunctional Utilization of Traditional Coppice Forests – An Answer to Future Ecological, Economic and Social Challenges in the European Forestry Sector” (EuroCoppice), with GFMC participation Fire Risk in Mediterranean Coppice Forests of Europe (I. Mitsopoulos); Brussels, Belgium. Forest Fires Meeting (Rencontres Feux de Forêt – RFF) 2013, Entente pour la forêt Méditerranéenne, with GFMC contribution Vegetation Fires and Global Change: Challenges for Europe and at Global Level (J.G. Goldammer); Valabre, Aix-en-Provence, France. First International Workshop for the STREAMS-2-SUPPRESS-FIRES Utilizing Stream Waters in the Suppression of Forest Fires with the Help of New Technologies Project, with GFMC participation Forest Fuel Sampling (I. Mitsopoulos); Drama, Greece. Meeting of the International Liaison Committee (ILC) and the South Korea Conference Organizing Committee (SKCOC) of the 6th International Wildland Fire Conference (South Korea, 2015), hosted by the Korea Forest Research Institute (KFRI) and Korea Forest Service (KFS) (J.G. Goldammer); Seoul, Republic of Korea. Meeting of the Pan-Asia Wildland Fire Network (Cluster of the UNISDR Regional Wildland Fire Networks of SE Asia, South Asia, Central Asia, NE Asia and Eurasia), hosted by the Korea Forest Research Institute (KFRI) (J.G. Goldammer, O. Byambasuren); Seoul, Republic of Korea. Consultative Meeting “Improving Coordination on Environmental Emergency Response” (following UNEP Governing Council adopted Decision UNEP/GC.26/15 on Strengthening International Cooperation on the Environmental Aspects of Emergency Response and Preparedness), jointly organized byUNEP and the UNEP/OCHA Joint Environment Unit (J.G. Goldammer); UN Geneva, Switzerland. Work visit of Brian J. Stocks, President, B.J. Stocks Wildfire Investigations Ltd., Canada, in preparation of the International Congress and Trade Fair on Forest Fire and Climate Change: Challenges for Fire Management in Natural and Cultural Landscapes of Eurasia; GFMC. International Congress and Trade Fair on Forest Fire and Climate Change: Challenges for Fire Management in Natural and Cultural Landscapes of Eurasia. Hosted by the Russian Federation in partnership with the Global Fire Monitoring Center (GFMC) (J.G. Goldammer, P. Sheldon, O. Byambasuren); Novosibirsk, Russian Federation. Annual meeting of the Directors of the European and Mediterranean Centres of the EUR-OPA Major Hazards Agreement Meeting (EUR-OPA) (Open Partial Agreement on the Prevention of, Protection Against, and Organisation of Relief in Major Natural and Technological Disasters), Council of Europe (J.G. Goldammer); Council of Europe, Strasbourg, France. UNECE/FAO Regional Forum on Cross-boundary Fire Management, organized by the UNECE/FAO Team of Specialists on Forest Fire through its Coordinator  the Global Fire Monitoring Center (GFMC), Germany, and supported by the Council of Europe and the Organization for Security and Cooperation in Europe (OSCE); (J.G. Goldammer, P. Sheldon, O. Byambasuren); United Nations, Geneva, Switzerland. Annual course “Fire ecology of Tropical, Subtropical and Temperate-boreal Forest Ecosystems”, Faculty of Environment and Natural Resources, Institute of Forest Science, Freiburg University, Freiburg University (Germany), given by GFMC staff (J.G. Goldammer, B. Oyunsanaa); GFMC / Freiburg University, Germany. Metsä 2013: Joint session of the UNECE Committee on Forests and the Forest Industry and the FAO European Forestry Commission, with side event “Achievements of the UNECE/FAO Team of Specialists on Forest Fire (1981-2013)” (J.G. Goldammer); Rovaniemi, Finland. 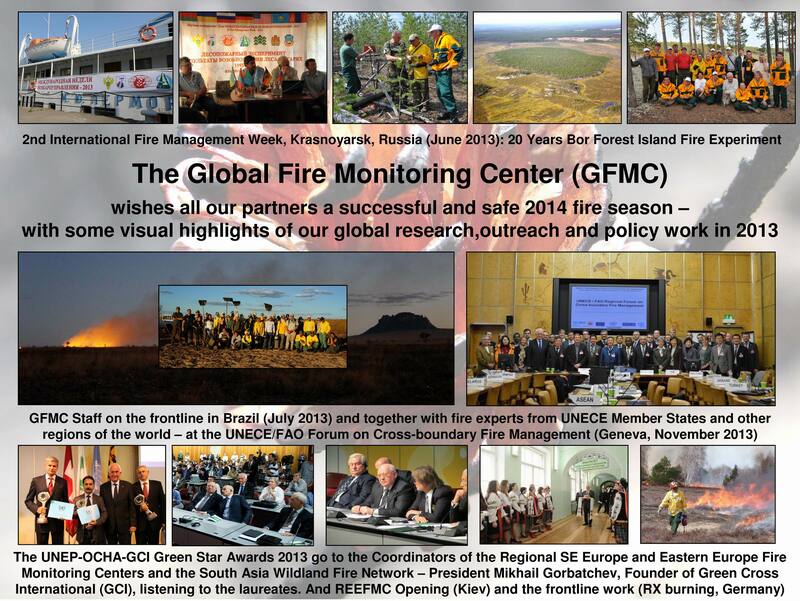 GFMC greetings for 2014: Happy New Year to all colleagues, cooperators and especially the members of the Global Wildland Fire Network, with some visual highlights of the outreach and policy work of GFMC in 2013.